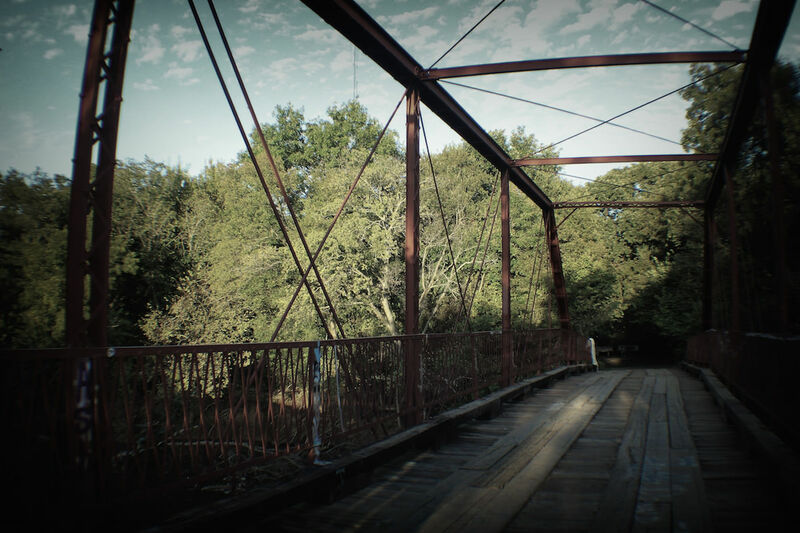 Scary story of Goatman’s Bridge, one of the most haunted spots in Texas. Written by Shaun Jex. Folks in Denton County, Texas knew Oscar Washburn as a reliable man with good business sense. He lived with his wife and children in a wood shanty with a tin roof, not far from Alton Bridge and Hickory Creek. Washburn made his living as a goat farmer. Locals affectionately referred to him as the “Goatman” and people came from all over to buy his milk, meat, and cheese, as well as the yarn that Washburn’s wife spun. He became so popular that he even painted a wooden sign that read, “This Way To the Goatman’s”, which he hung on Alton Bridge so that prospective customers knew how to find him. The sign served its purpose, guiding more customers to his home, but it also caught the attention of local Ku Klux Klan members. With the country locked in the depths of the Depression, the Klansmen were angry to see a man of color succeeding while so many others struggled. They decided to put a stop to it. One evening, they came to Washburn’s shanty carrying torches. They demanded that Washburn come out of his house. He emerged from the house toting a shotgun, telling the men to clear off his property before firing a warning shot into the air. The Klansmen fled, but not before declaring that he would be back to teach him a lesson. Washburn returned inside to find his family cowering in the corner of the shanty. For a time, life returned to normal. Washburn tended to his goats and people continued to come to buy his wares, but not as many as before. Word had gone out that the Klan would terrorize anyone who gave him business. His wife continued to plead with him to move, and Washburn continued to refuse. One evening he woke to hear his goats frantically bleating. Jumping out of bed, he ran outside to find a man slitting the throats of his animals. In a blind rage, he rushed toward the man. He chased him across the Alton Bridge and found himself surrounded by a posse of hooded Klansmen. Realizing that he had run into a trap, Washburn screamed a warning to his family. He tried to run, but was quickly overtaken by the mob. They knocked him down in the middle of the bridge and several members of the Klan pinned him down, while another tied a noose around his neck. Washburn fought like a man possessed, kicking and struggling to no avail. After tightening the noose, the Klansmen hoisted him up and dropped him over the side of the bridge. When they were satisfied that Washburn was dead, they moved to his home. The men surrounded it from all sides, setting the shanty on fire and killing the woman and three children trapped inside. Washburn’s body was left hanging for days. Several members of the mob even returned to take photographs, selling the images as postcards in a local mercantile. Then, the body simply disappeared. No one knew what became of it. Folks speculated that the rope broke and he was carried down stream, or that some kind hearted local finally cut his body down to give him a proper burial. Rumors that the Goatman still roamed the area began soon after. People reported seeing him walking across the bridge or standing near the grounds where his shanty stood. The stories grew when several members of the lynch mob died under curious circumstances. One died choking as he ate his dinner. One took ill and died of fever, hallucinating and shouting at ghosts. Two were killed in a drunken car accident while crossing the Alton Bridge at night. Though any physical trace of Oscar Washburn, his family, and his home have long since disappeared, residents will tell you that you his ghost still lingers in the area. Car wrecks on the nearby road are attributed to the wrath of the Goatman. Visitors report sighting his ghost walking along the river, while others have claim to have seen his body hanging from the bridge. Still others say that if you visit the bridge at midnight, the ghost of the Goatman will attack you and that if you stand where his home once stood, you will feel your skin begin to burn. Another version of the legend suggests that if you stand on the bridge late at night you can hear the voice of Washburn, calling out his oath. Goatman\'s Bridge, Texas 33.129304, -97.104238 Story: The Goatman\'s Bridge: Texas Ghost StoryScary story of Goatman\'s Bridge, one of the most haunted spots in Texas. I’ve been collecting folktales and ghost stories for nearly a decade and I’ve been considering starting a podcast. I was wondering if you would give me permission to use your story on our podcast. With credit given of course. You’d have to ask the author, it wasn’t written by us. Feel free to email us your contact information and I’ll pass it along to him.